Moon Knight #9 CGC SS 9.6 NM White Pages. Signed by Frank Miller! This comic lays flat and presents well. Tons of great comics from all publishers and from all different periods will be listed over the next few weeks. "Venom: Lethal Protectors" #1 February '93 Comic Book in nice NM condition. Cool "Red Foil" Cover -featuring an Appearance by "Spider-Man". -by Marvel Comics, New York, N.Y.
Battle Chasers 1,2,3,4,5,6,78 with Prelude and Variants! NM+ NO RESERVE Unread! Battle Chasers 1,2,3,4,5,6,78 with Prelude and Variants! NM NO RESERVE Unread! Prelude - 4 copies including gold foil copy. Never opened, never read. #7 - 7A - Joe Madureira cover, 7B -J. Scott Campbell Cover and 7C - Humberto Ramos cover. Circa1940s?. Very difficult to find! The card is a little rough but the dog still has 2 red eyes and a collar of white rhinestones. Very cute. THE UNCANNY X-MEN #157 CGC 9.6 NM DARK PHOENIX RETURNS! NO RESERVE! MOVIE SOON. Priority mail shipping! Cover isn't really glossy at all. Pages are whitish but mostly yellow. Superboy #10 1st Lana Lang Golden Age, by my subjective opinion 2.0 Good, cover detached, complete, heavy wear. Front Cover: Good, black marking near dog neck "10/30". Back Cover: Looks good, normal wear. I trust the knowledgeable ones to know how much they are worth and their grade, for I don't have a clue. Magilla Gorilla #9 (Oct 1966, Western Publishing) VG.Sleeved/Board. Jungle Action #5 FN See Scans (Jul 1973, Marvel). Grade: CGC 4.0. Published 1937 by United Features Syndicate. of comics, generally about 25-40 comics depending on page count. Uncanny X-Men #266 CGC 9.0 1st Gambit. Signed 3x SS Lee Clairmont Rubenstein. Shipped with USPS Priority Mail. Case is excellent. Signatures look great! The scan(s)/photo(s) show the exact comic(s) you will receive. We list new comics every week! Don't be afraid to send us one! This is a great Silver Age lot containing the 1st 8 issues of Marvel's Parody series. The condition of the books are great. My estimated grade reflects browning of white front/back covers, which is common for books of this age. Marvel Masterworks Variant #74 limited to 1525 hardcover copies, presenting Daredevil now 33-41 and Fantastic Four 73. Out of print and SEALED!! As with all my auctions, items have been stored away from sunlight and in a climate controlled room. By my personal favorites: Stan Lee (of course) and Gentleman Gene Colan!! 1st Appearance of Buck Rogers in comics! Beautiful CBCS 3.0 (GD/VG) example - Off/White to WhitePages with Good Gloss quality! Famous Funnies #3 EASTERN COLOR 1934. "Famous Funnies!". -Great color. -2 tiny pieces of tape on centerfold. Vintage 1930’s 1936 Bobby Benson Western Cowboy Comic Chapter Books You get both shown! Both are dated 1936 “Bobby Benson and The Lost Herd” “Bobby Benson in the Tunnel of Gold” both by Peter Dixon - each softcover book is roughly 80 to 100 pages each -both color and black and white illustrations Both are in excellent condition, with no missing or torn pages, and no writings. Their bindings/spines are also excellent. Transformers #5 CGC 9.6 Marvel 1986 Marvel Death Issue Comic:New Frame. Shipped with USPS Priority Mail. Magazine is in good condition but not maintained to collector's standards. It shows signs of age, use and years of storage including possible creases and storage discoloration/stains. 16" by 5 1/2" hard cover comics book. Very cool piece. Front Cover: Good, There is a pencil "6" in the I of Pirates, bottom right corner bent/creased. Back Cover: Looks good, normal wear. I trust the knowledgeable ones to know how much they are worth and their grade, for I don't have a clue. I trust the knowledgeable ones to know how much they are worth and their grade, for I don't have a clue. Back Cover: Looks good, normal wear. Front Cover: Good, Top of printing cut off when manufactured. Front Cover: Piece out of side edge. Back Cover: Looks like it was re-stapled. See last picture. I'm willing to work with you! These annuals and thicker comics will not be in a protective sleeve or backer board because they make the books bend. 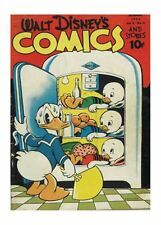 The issue is the 1st full color issue in the series and has the classic full Donald Duck cover. The only writing inside is the crossword in pencil. The book has a subscription / fold crease. Marvel, original comic art, history, DC, batman, superman, green lantern, stan lee, book, EC, Comic code. 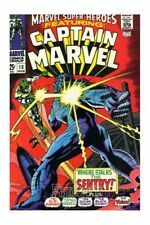 Own a piece of comic book history! This is a CGC graded 9.8 copy of Harbinger #2 released 2/92. This is a comic of Captain Marvel No. 2 published by the Marvel Comics Group in Jun., 1968. Feel free to call us M-F, 9-6 EST at 508-829-2259 or 508-UBWACKY. See us at shows around the country! including a hugehalf-price section! 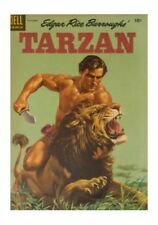 Amazing Inventory of Gold, Silver and Bronze Comics and Original Art. This sale is for 1 IRON MAN #128 published by MARVEL Comics in 1979. This sale is for 1 JUMBO COMICS #93 published by FICTION HOUSE Comics in 1946.